All of our canoes and kayaks are made from linear polyethylene. They require no treatment to maintain the surface and can be stored outside year round. For short term storage, you should turn your canoe or kayak upside down when left on the ground or dock. Always try to store your boat on a rack or hanging in slings. Canoes should be supported by their gunwales. 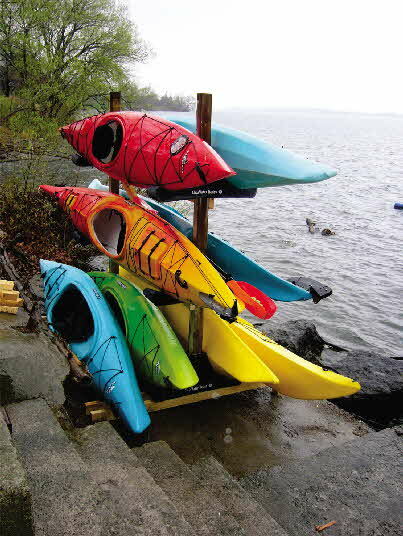 Kayaks can be hung on their sides or upside down; try to place your supports at the bulkheads. If you develop a dent in your canoe or kayak due to improper storage or from over-tightening your tie down straps, here are some suggestions. First, let the boat sit in the hot sun. Often, the dent will come out all by itself. If that doesn't work, prop the boat up on a couple of camp chairs so that it is supported near the ends. Place a weight, such as a bag of sand, on the indented area and let it sit for a couple of hours. For best results, this should be done outside on a hot sunny day. You can also warm the dented area by pouring hot water over the area before placing the weight.